Historically the retail convenience stores attached to gas stations are small in size with a limited selection of essential household and automotive products, along with a small selection of packaged and prepared takeout food and beverages. But the largest convenience store in the world is neither small nor limited, and rivals some full-size grocery stores and discount department stores in terms of store size, square footage, product variety and selection, and retail sales floor space. Surprisingly, the world's largest retail store is not part of a major convenience store chain run by the biggest gas station companies like ExxonMobil, BP, Shell, Because of its size and product mix, some might argue that the world's largest convenience store is not a convenience store at all. So, what is the world’s largest convenience store and where is it located? With 67,000 square feet of retail sales space, Buc-ee’s in New Braunfels, Texas, is acknowledged to be the world’s largest convenience store. To compare, you could fit 22 average sized 7-Eleven convenience stores inside this world’s largest Buc-ee’s. Two average sized Whole Foods stores could fit inside the New Braunfels Buc-ee’s. Wal-Mart’s Neighborhood Market stores are almost 40 percent smaller than Buc-ee’s world’s largest store. The Buc-ee’s World’s Largest Store (located at 2760 N. Interstate 35 Frontage Rd. in New Braunfels) was not the first Buc-ee’s convenience store. Buc-ee’s was founded by Arch “Beaver” Aplin and Don Wasek when they opened their first Buc-ee’s convenience store in Lake Jackson, Texas. The concept behind this first location was cheap ice cream and clean restrooms. 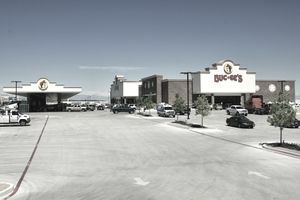 The formula was popular with customers, so the Buc-ee’s chain slowly expanded, along with the concept itself and, obviously, the size of its stores. The New Braunfels world’s largest Buc-ee’s opened on May 7, 2012. Besides having the world’s largest designation, the New Braunfels Buc-ee’s has also been recognized as having the World’s Cleanest Restrooms by Cintas business supply company. This would be a notable accomplishment for any convenience store, but particularly for this Buc-ee’s location, which has 83 restroom stalls to keep clean 24/7. Buc-ee's was voted the "Best Restroom in America" by B2B supply company Cintas in 2012. The World's Largest Grocery Store Chains: Although there are plenty of hypermarket retail chains like Walmart and warehouse chains like Costco that sell groceries, when comparing retail chains that are strictly classified as supermarkets and have groceries as their primary merchandise offering, the largest grocery store chain in the world, measured by annual revenue, is 7-Eleven with over 46,000 outlets in 16 countries. The Guinness Book World's Largest Retail Store: It used to be Macy's that laid claim to the World's Largest Retail Store title for its New York Flagship store in Herald Square. But in 2009, the American retail icon was dethroned by a South Korea retail store, which is still the largest with 3.16 million square feet of sales floor space. The World's Largest Bookstore: Depending on how you measure "largest," there are three different bookstores with legitimate claims to the "World's Largest Bookstore" title. They are Barnes & Noble in New York, The World's Biggest Bookstore in Toronto, and Powell's Book Store in Portland, Oregon. The World's Largest Shoe Store: Even more controversial than the claims to the World's Largest Bookstore title are the three stores that lay claim to the World's Largest Shoe Store title. Macy's, Selfridge's, and Level Shoe District in Dubai all have laid claim to the World's Largest title and for good reason.